For the first time, astronomers have found a microquasar -- a black hole devouring material from a companion star -- in a galaxy beyond our own Milky Way. The object, pumping out X-rays and bright bursts of radio waves, was found in the Andromeda Galaxy, 2.5 million light-years from Earth. 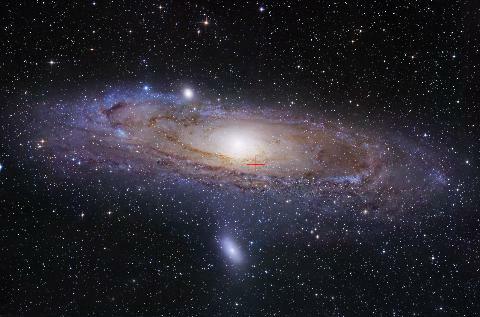 The Andromeda Galaxy (M31): Crosshairs show location of microquasar. The discovery, scientists say, gives hope that more such objects may be found in nearby galaxies, providing them with opportunities to make detailed studies that will unravel the mystery of just how these enigmatic powerhouses -- and their big brothers -- actually work.